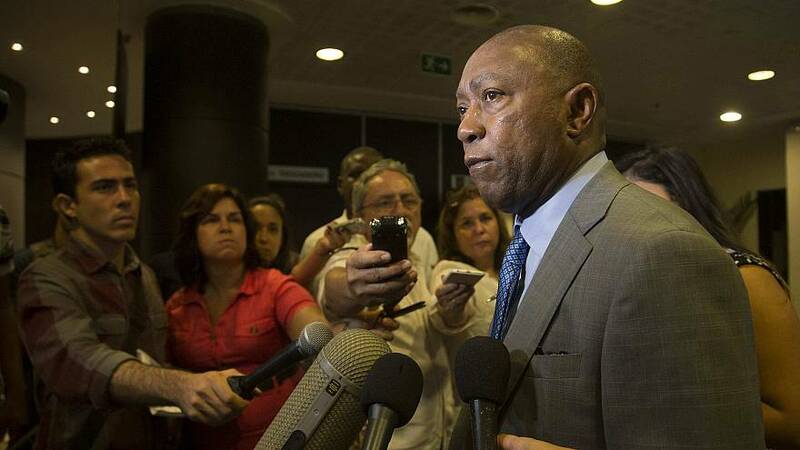 In a moving plea for help from the state and federal government, Houston Mayor Sylvester Turner was joined at a Thursday press conference by three of his constituents who remain displaced by Hurricane Harvey nearly four months after the storm made landfall. "Literally, there are thousands of people living in homes that need to be remediated," said Turner. "And there are thousands of people who are still living in hotels. And the question is, where do they go when FEMA says, 'No more'?" The push is part of Houston and Texas's request for Congress to approve a bill for $61 billion in federal assistance. Thus far the state has received $11 billion in federal disaster aid — far less than the nearly $115 billion of federal assistance provided after Hurricane Katrina or the $56 billion after Hurricane Sandy. Turner also asked that Texas Gov. Greg Abbott provide the city with $200 million from the state's rainy day fund, which he said currently carries $11 billion. The mayor said his plan is to repay the loan with federal aid once Congress has approved it. Abbott has claimed there is no need to touch the fund until 2019 when the state legislature next reconvenes in regular session and can decide how to use the funds. The Texas governor also rejected the Turner's call for a special session of the legislature. "We cannot wait until 2019," Turner said in response to Abbott. "There are things that need to be done right now." A little over an hour after the press conference, the House passed an $81 billion disaster funding bill for Texas, Florida, California and Puerto Rico, 252-168. The Senate was not expected to act on the bill until next year. "It's a lot more complicated, a lot more moving parts, a lot more varied interests, competition between various jurisdictions over who gets what," Senate Majority Whip John Cornyn, R-Texas, said of the bill. "So, it's just not likely [the Senate will vote on it this year.]" Sen. Ted Cruz, R-Texas, excoriated his colleagues in a speech on the floor of the U.S. Senate Thursday evening, calling it "wrong" and "maddening" that the Senate would not pass further disaster relief for Hurricanes Harvey, Irma and Maria before leaving on holiday break. He also noted that the House bill would only provide a fraction of the $81 billion to his home state, which he said was not nearly enough. "I'm sorry to say that the United States Senate is now leaving town without delivering on its commitment to help Texas, to help Florida and to help Puerto Rico to recover," Cruz said. Earlier on Thursday, Turner also emphasized the "urgent" and immediate need his city had, and he asked three Houstonians — Karen Knight, Christina Quintero and Deborah Williams — to share how they lost their homes to Hurricane Harvey to highlight the necessity for aid. "I was waiting for my house to be rebuilt and that's been since Aug. 25 when the storm came," said Williams, whose home took four to six feet of water. "Now I'm currently living in a hotel and I don't know how long I'll be able to stay there because they don't do that for free." Quintero tearfully spoke of her two children, one of whom is autistic, and their inability to return home because all of their possessions and the interior of the house was destroyed in the flood water. They now live with Quintero's parents nearby. "Everyday he has nightmares because he walks back to his house, he opens the door and he sees a gutted home where we took out everything to make sure there was no mold so they could have a safe and healthy home," Quintero said of her autistic son. Knight said she is a single mother of five children. Her daughter is paralyzed, and her doctor told her that their home was not safe for the child. "It's unlivable," Knight said, describing her home. "It's full of mold. I tried to get some help with contractors and whatnot and go out the cheap way, so I could get back home only to find out that there are people who will take advantage of you." "This is the face of Harvey that still needs to be addressed," said Turner.